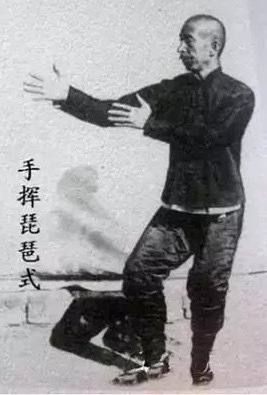 An article published on Taiji Yiren, a Chinese site created to promote Taiji culture, reported the response by Chen Zhaoxu to the question – “How do you train this martial art”? Chen Zhaoxu (the eldest son of Chen Fake and father of Chen Xiaowang and Chen Xiaoxing) answered, “You have to fangsong (loosen) the “four big pieces” in the body”. That is the two shoulders and the two kua. 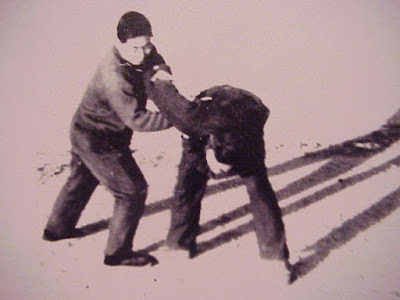 Chen Zhaokui - "First thing is to control an opponent's shoulders"
you can reverse the attack and escape. 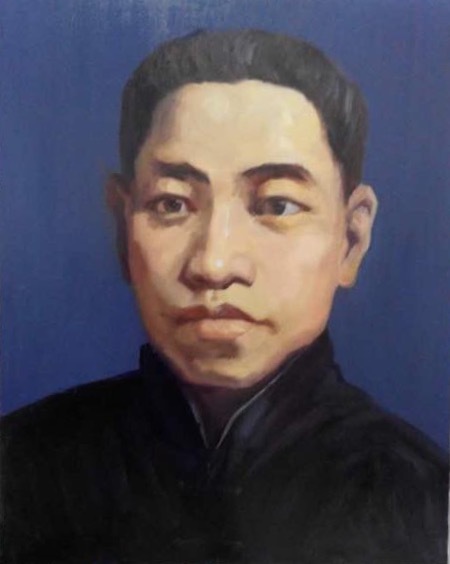 Chen Zhaokui spoke of the relationship between the shoulders and the kua: “Relaxing the chest and shoulders facilitates the folding movement of the torso and that has a direct relation to the kua being relaxed. Sun Lutang - "First solve the problem of the shoulders and kua"
Sun Lutang, the renowned internal martial artist and creator of Sun Style Taijiquan believed that, such was the importance of these four joints that in the early stages of training learners should focus upon them above everything else: “The key is in the shoulders and kua. In the beginning don’t think about anything else – just solve the problem of these two parts”. He advised learners to constantly think about how to relax and sink (ie don’t lift) the shoulders. This focus should be carried over to encompass one’s daily activities – “In your everyday life think about sinking your shoulders and dropping your elbows. [In time] you’ll see an obvious change”. Sun Lutang was of the opinion that a lot of people who have trained gongfu for many years have not succeeded in opening their kua. Concluding that this was a serious failing that he believed meant that no matter how much effort they put in, without addressing this shortcoming, whatever they you train will be incorrect”. Sun cautioned practitioners to be patient, advising them to only move on to other aspects of training when this basic requirement was achieved. Relaxing the shoulders and the kua is crucial if one is to develop an integrated body and from that point start to open up and stretch the rest of the joints: “After your shoulders and kua open other things are not so difficult. If you are diligent and persevere your body will start to change shape – you might even get unexpected results”. Before the focus on the kua and shoulders is going to be understood, people are going to have to switch their thinking away from the western view of body movement to the old Chinese view of muscle-tendon channels, cutaneous channels, and the dantian manipulating movement by pulling on those channels, etc. The shoulders and kua are "joints" along the channels; the three dantians mostly controlling those channels are the crotch dantian, the main dantian, and the chest dantian. If you tense anything, you wind up disrupting the flow of strength.